Supplement Date: Dec 2018 i Previous editions(s) can be found in the Related Items tab. 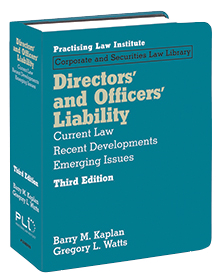 The third edition of Directors’ and Officers’ Liability provides an up-to-date, straightforward explanation of the obligations of directors and officers of public companies, the penalties that they face if they fail to meet their obligations, and the protections that are offered them under the law or by agreement. Authors Barry Kaplan and Gregory Watts (Wilson Sonsini Goodrich & Rosati) guide readers through the sources of law governing the duties of directors and officers; exculpation, indemnity, and insurance; cybersecurity and other topics of utmost importance to directors and officers. Directors’ and Officers’ Liability is an essential resource for directors and officers, and the attorneys who advise them, as well as business managers, business associations, and federal and state regulators. Barry M. Kaplan is a partner in the Seattle office of Wilson Sonsini Goodrich & Rosati where he is the head of the Wilson Sonsini Northwest Litigation Group. Mr. Kaplan has broad experience in securities and corporate governance litigation, class action defense and SEC and internal corporate investigations. He has represented numerous public companies and their officers and directors in shareholder litigation including many well-known companies such as Boeing, Micron Technology, Alaska Airlines and Starbucks. He has represented and continues to represent many public biotech companies and their officers and directors across the country. Mr. Kaplan has spoken at dozens of programs on securities litigation and corporate law and governance topics, and has taught courses in securities regulation and shareholder litigation at the University of Washington School of Law. He co-authored the leading treatise on Washington corporate law, originally published by Prentice-Hall. Upon graduating from the University of Michigan Law School, Mr. Kaplan clerked for the Honorable Charles W. Joiner in the U.S. District Court for the Eastern District of Michigan. Best Lawyers in America named him the 2012 Securities Litigator of the Year for Seattle—the first time that this honor has been awarded to a Seattle securities litigator. He was again honored with this award for 2016. Gregory L. Watts is a partner at Wilson Sonsini Goodrich & Rosati, where he focuses on securities and complex commercial litigation, primarily defending companies and their directors and officers in securities class actions, shareholder derivative actions, contested mergers and acquisitions, and SEC investigations and enforcement proceedings. He also advises audit committees, special committees, and boards of directors in internal investigations. Mr. Watts has represented dozens of public companies in securities litigation, including many well-known companies such as Banc of America Securities, Boeing, Outerwall/Redbox and Starbucks. A frequent lecturer on director and officer liability, corporate governance, corporate internal investigations, and securities litigation, Mr. Watts is an advisory board member of the National Association of Corporate Directors, Northwest Chapter and co-chair of the Northwest Securities Institute. Mr. Watts received his J.D. from Duke University School of Law where he was a member of the Duke Law Journal.